March 17, 2014, 10 a.m. Using Twitter and contributors from across Turkey, 140journos is fighting government censorship by providing independent news. By Joseph Lichterman @ylichterman March 17, 2014, 10 a.m.
Engin Önder is not a journalist, and he’ll be the first to tell you that. (“No way,” he said, laughing, when I asked.) Instead, Önder, who cofounded the Turkish citizen journalism platform 140journos, considers himself a citizen acting journalistically to share information and spark discussions about political issues in Turkey. Önder and his two cofounders were inspired to launch 140journos after a December 2011 incident when Turkish fighter jets killed civilians along the Turkey–Syria border, an event that went virtually uncovered by the professional media in Turkey. Önder had already cofounded the Institute of Creative Minds, which is dedicated to facilitating discussions in the public space. They saw the Internet as an extension as of that space and began posting updates from rallies, court hearings, and other events directly to their Twitter account, whose character limit is the source of the 140 in their name. 140journos gained notoriety among the Turkish media during a controversial trial that Önder livetweeted. The judge was not pleased that the trial was being tweeted, so he kicked credentialed media out of the courtroom. Önder, not credentialed, continued to tweet. But 140journos really didn’t take off until last summer’s massive Gezi Park protests in Istanbul. Until then, 140journos really only used tweets generated by the group’s core members. But once the protests began in earnest, 140journos began receiving information from people on the ground in Gezi Park, Taksim Square, and elsewhere around Turkey. 140journos posted 401 tweets in May 2013; in June 2013, when the protests started, they posted 2,218. With the influx of information from their followers, 140journos’ purpose shifted. “Our function has changed into curation, storytelling, and verifying,” Önder said. They now have a growing network of 300 or so contributors across Turkey who tweet information, photos, videos, and more at 140journos, which then sends it out to its audience of more than 40,000 Twitter followers. The core team has also grown to seven, so there is always somebody running their Twitter account and filtering the information coming in. 140journos is now slated to release a beta version of a mobile app this month, ahead of local elections on March 30. The app will allow users to submit geo-located photos and videos. The app will allow users to see the submitted content on a map that will also show local pharmacies, weather forecasts and other information. 140 Journos is also partnering with two groups of about 3,500 volunteers monitoring the upcoming local elections to test the app. Önder and University of North Carolina professor Zeynep Tufekci spoke last week in an event we cosponsored at the Berkman Center for Internet & Society. They discussed the role of citizen journalism in Turkey, censorship in the Turkish media, and what’s next for 140journos. What follows is an edited transcript of a group conversation after Önder’s presentation and a separate interview I conducted with the pair. One of the key questions raised: Is what 140journos does journalism? Zeynep Tufekci: I’ll go with Jay Rosen’s definition: If you’re telling people who aren’t there about something that’s happening that’s a form of journalism. I’m less concerned about what the boundary is and more concerned about how we create a healthy civic sphere. Question: There’s not a right answer or a wrong answer, but I’m sure many people doing something similar to 140journos would say that they’re a journalist. Tufekci: Part of the case is the context in this country, that the journalists weren’t doing their job. It’s not something to aspire to. A journalist is what the editor tells them to do in Turkey — whereas here they’re explicitly defining themselves as not what the editor tells them to do. So if that’s how you define what a journalist is, then they’re not journalists. Question: Is local media feeling any shame or any pressure from citizen media? Are you seeing any changes in behavior of Turkish television stations and newspapers, particularly after Gezi has been covered by citizen media? Önder: The CEO of CNN Türk, Ferhat Boratav, underestimates citizen journalism. He probably sees it as a threat to their existence. I heard this in a personal conversation that he blames citizen journalism with providing misinformation, poisoning the public. So he’s very mad at citizen journalism. But aside from this, among media workers, employees, there is a trend that they become pirates because they feel so ashamed. They have studied for this. They are professionals. They cover whatever is going on. They share it with the editor in the plaza, in the skyscraper, in the media holding, and the editor, who gets orders from the top, says we can’t publish this. They feel so ashamed about the existing situation in their profession, and they become pirate journalists. There is a group of 10 very professional correspondents, working for big news channels in Turkey, who are our anonymous contributors. That makes me happy, and they are relieved because they are saying, “I’m getting paid, but my news is not published.” It’s so sad. Tufekci: There has been a significant change since Gezi. Not in the sense that they’re on top of everything — but I’m seeing more actual news being carried live. In my read, it’s partly them, because if they hide it, everyone knows they’re hiding it. Their censorship is very visible. Also, people marched. People marched to these news stations and waved money at them and said, “We’ll pay you — just do your job.” I think they were a catalyst in that they made it clear what the censorship was, but it also became a movement. There was so much anger toward them that the line they have to walk has shifted. They can’t be as bad as they were before. Yesterday on CNN Türk, they interviewed the father of the youth who was killed, which was a big deal. I can’t imagine him being on live TV a year ago — which is such a minor thing. It’s clearly news. But it’s shifted and I think you’re part of it. Önder: There is some dust of courage in the mainstream media, but more importantly, citizens are more aware — and rather than marching to the headquarters of news channels, they just share what they see. It’s just more effective, in my opinion. Tufekci: Also, in Gezi, just to corroborate, I’ve seen people show me their wounds from tear gas canisters. And I asked what happened, and they said, “Oh, I went to the front lines.” “Why did you go?” “So I could send a picture.” So people are taking risks sometimes to document events. They are not just chancing upon things. When they hear of something, they go. I have pictures of people’s leg gashes from citizen journalism. Question: Have any professional journalists had any discussions about setting up more independent journalism operations? ÖnderThere was excitement after Gezi, and all the attempts refer to the Gezi Park protests and the demand people expressed from the mainstream media about coverage. But I think this is a false inspiration. The ones who protested the attitude of news channels in front of their headquarters are plaza workers — white collar, and they protested at lunchtime. This isn’t so courageous. That’s why I think this is a false inspiration. Gezi was a 15-day dream from different perspectives. We learned so much stuff, but still there is this lack of finance and people are in fear of starting something but then failing. They don’t want to fail. We are observing some attempts in our social circles — journalism professionals are discussing this. They’re sharing ideas with us and are asking if they can use our content in their platform to be created at some time. But generally there is no clear, sustainable plan. Getting inspiration from Gezi, in that sense, may be manipulative. But I have faith in Turkish alternative media if they focus in creating a media without any monetary basis. Question: That alternative media is volunteer based? Önder: All volunteer based. We are still making our livings from other electronic arts projects. We don’t make money out of this. I came here for a variety of purposes, but one of them is to meet our coder, who lives in New York. We have developed a beta version for a qualified citizen journalism app. Before the local elections at the end of this month, we will release a beta version for our regular content producers. We want them to test the product, and according to their feedback we will add more facilities. We have a big plan, but the first beta version is more primitive. Question: Do you have plans to sell ads or monetize in any other way? Önder: The first concern is to create content. I’m making my life from somewhere else. I want people to be aware, and we have created a brand for this somehow, and it’s time to make it more qualified. I don’t care about money so much. It took like two years to find the most appropriate coder, because they only think about how they can make money. But now our team is consisted of realistic and idealistic people and I’m so happy about this. Question: Do you feel a sense of responsibility toward the people contributing? Aren’t they possibly entering dangerous situations? Önder: They are not happy with the course of the country, and they think if they share what they see, it might matter. If I record police violence and it circulates on the web, it creates an awareness and people increase their voice to the government, to the police, to the unlawful acts. Question: Is there more pressure or responsibility to verify the content coming in from your sources? Önder: This is what we pay attention to the most. We are not journalists, but we are practicing one of the principles. We saw what misinformation could lead to. This is very scary. To get to the point we desire, we have to give correct information to the people following us. If we give correct information, they will understand each other better. That’s the criteria. If we don’t know what to do about specific information, we ask if it goes toward our ultimate purpose of creating empathy between societies, between people, between communities in Turkey, between minorities and majorities. That’s the only self-interrogation that we carry out on every occasion. Question: How do you anticipate the new Internet laws affecting your content and your ability to share information? And are you taking any preventative steps to make sure things don’t go awry if the government goes after you? Önder: We have friends from the Pirate Party in Turkey, and they are giving us alternative ways to share the content. The most commonly known is VPN, but there is other stuff. But the point is that the law passed. Practically, we haven’t seen any effect yet. Once we see, I can say something. It can be interpreted in so many ways. The sentences in this awful law can be interpreted in many abusive ways. We haven’t seen any effect yet though. Tufekci: They think they’re going to archive Twitter. We shall see what happens. It’s really, really murky, but this is something not secret — there’s a lot of suspicion that they’re offloading the Internet anyway, so mining Twitter is more of a means to legally prosecute people, which is different than having access to the data. The Internet backbone goes through the ministry, so they have the stuff, but it’s not always in a court-admissable form. The new law is about making the surveillance court-admissable and also making it the work of ISPs, because it is a huge infrastructure. Önder: I don’t think we’re doing anything illegal. We are just sharing the content we see. Unlike Anonymous, we are not anonymous. We are in front of the public with our names. We give interviews. It takes like five seconds to find my house address on the Internet, probably. We are not hiding from anybody, and because of this content culture of sharing neutral information without any commentary, ministers are following us. Ministers of this conservative government are following us, because their channels are not covering the social issues. Photo of Engin Önder by Zeynep Tufekci. POSTED March 17, 2014, 10 a.m.
Lichterman, Joseph. "Q&A: Engin Önder and Zeynep Tufekci on 140journos and the state of journalism in Turkey." Nieman Journalism Lab. Nieman Foundation for Journalism at Harvard, 17 Mar. 2014. Web. 19 Apr. 2019. Lichterman, Joseph. 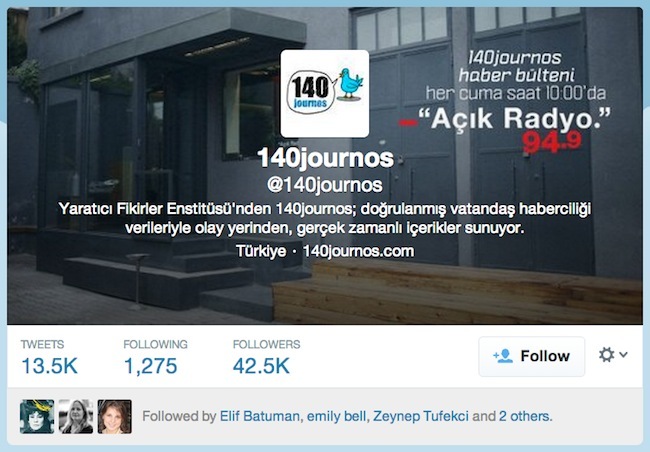 "Q&A: Engin Önder and Zeynep Tufekci on 140journos and the state of journalism in Turkey." Nieman Journalism Lab. Last modified March 17, 2014. Accessed April 19, 2019. https://www.niemanlab.org/2014/03/qa-engin-onder-and-zeynep-tufekci-on-140journos-and-the-state-of-journalism-in-turkey/.